Rinse chicken meat and pat dry with paper towels. Trim fat and cut into bite-size. Marinate for 20 minutes. Preheat oven to 200C (390F). Heat oil on saucepan and sauté minced garlic. Toss in onion and sauté until translucent. Add marinated chicken and cook over medium heat, until lightly brown. Add potatoes and carrots, stir until evenly heat all ingredients. Sprinkle turmeric powder and cumin powder. Stir fry until aromatic. Pour chicken stock and bring to a boil. Slow heat to medium-low and cook until the potatoes turn soft. Add green beans and capsicum and cook for a while. Add coconut milk and bring to boil again. Add thickening and cook to your preferred consistency. Season with salt and pepper to taste. Taste by yourself until you’re satisfied. While cooking the sauce, heat up another wok (or frying-pan). Add whisked egg to fry rice. Head over and take a look at how to fry yummy rice. Season with salt and black pepper to taste. Transfer fried rice (or hot white rice) to a ceramic baking dish. Pour coconut sauce over the rice. Sprinkle cheese to your preference. Bake for 10 to 15 minutes until cheese turns golden. Done. Serve hot. Use the left-over rice to fry is the key to have yummy fried rice. If you use white rice, it should be a bit drier than usual because it will absorb the coconut sauce while baking. This looks heavenly, not too difficult to make for busy people and non cooks like me. I'll try this sometime this week. This is a very interesting dish to me! Looks like curry but not spicy. Sounds great with coconut milk and cheese! Yeah, it's very easy to make. Hope you'll like it. Kids like this creamy and yummy dish. They would eat more rice. 葡汁时蔬 looks very good....esp. with cheese. Yeah, a bit like 葡汁时蔬 with chicken. That's good! Timing is very precious. I love this dish! So creamy and tasty! This looks and sounds fantastic. YUM! OMG this is the best thing ever! Growing up in NY's Chinatown, this is always the thing I would order at any HK Cafe/Diner. Relocated to London now, I'm so happy to find this recipe so I can recreate it at home! In order to make it richer, I used coconut cream instead of milk (no thickening needed thereafter). I also added 1/2 tsp of mild curry powder for a bit more kick (still not spicy, which is great). I used chicken thighs and removed the meat and used the bones to make the chicken stock. I added the chicken stock one scoop at a time to make sure it didn't get too thin/thick. I also omitted the capiscum as I was never a fan of it in this dish. I left the potatoes and carrots on the pan longer so it would brown more before adding any liquids. And then I added a tbsp of unsalted butter to add more rich flavor. IT'S AMAZING!!!!!!!!!!! I can't stop eating it. :P Oh and I LOVE this site! Keep it up! I tried this one tonight and it turned out well but I think I didn't have enough cheese. i mde this the night b4 last and was soo yumi and much cheaper than goin to a chinese restraunt hehe. i didnt hve over night rice which mde the fried rice bit soggy but was stil very tasty. thnkx christene! Thank you so much for this recipe! I made it last night and it turned out just like cha chan teng style. I added some minced red chili pepper for an extra kick. I'm going to try more of your recipes! Thank you so much for sharing this recipe! It was the only one for this dish that I found online. I'm excited to try it for lunch. It's a great dish which I used to have it in HK. I'm living in Sydney now and miss it so much. Although it got some good chinese restaurants/cafes around but it would be great to make my own hehehe My aussie husband loves it(he also loves the baked pork chop dish) Thanks for your recipe!! Squeeze the grated ginger, then use the ginger sauce for marinade. this recipe looks yummy. i'm going to try to make it. what kind of cheese do you use? I just grabbed whatever I had in my fridge. This time I used cheddar. Parmesan will do too. I just wanted to say thank you for all your recipes. I find myself wanting to cook so much from all the selections. Like you, I am also living in Melbourne and don't have time to eat out so much. 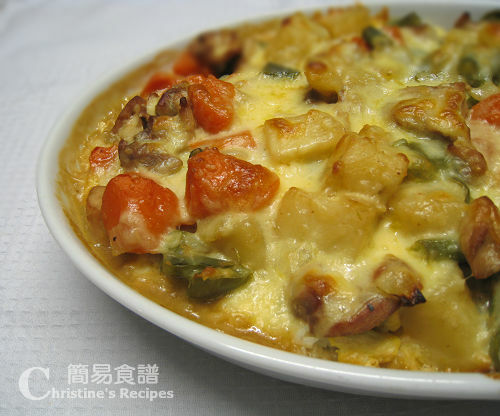 It's fantastic to know that I have so many authentic Hong Kong recipes to try from your list. Thank you for dropping by and leaving your feedback. Bake the rice seperately from the chicken ... Right?? Or put everything together? Put everything including the sauce on the fried rice, then bake in the oven until the cheese melted.